In our family, we almost always keep a bell pepper in the refrigerator. There are more than enough meals that can utilize a pepper, and there are some times where I'm scrounging for dinner and a pepper sets off my imagination. We've had good crops of bell peppers in the past and it's a great plant to have around if you're like me. 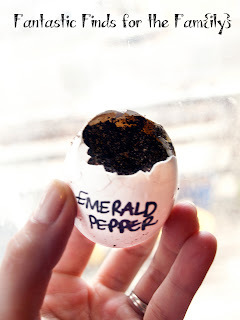 This year, we're growing Emerald Bell Peppers and I started the seedlings in eggshells, at a depth of 1/4" and they will take anywhere from 10-21 days to sprout. You'll want to try to transplant these when they have three true leaves, placing them in 4-5" pots and moving them into their final position when they're about 4" high. Make sure to harden these off and plant them after there is no danger of frost. You want to make sure they're getting enough water when it's really warm, but to not waterlog them. This is especially important when you're growing them in containers. Harvest them with scissors or pruning shears when they're green to encourage more growth, or leave them on to have them change color. Waiting to harvest them will make your yield less, however, so I recommend picking them when they're green. They will store for about two weeks once harvested. At the end of the season, you can uproot the plants and hang them by their roots and the fruit will continue to ripen.